I’m a pretty huge fan of Bob Reynolds’ occasional vlogs. He’s a saxophonist based in Los Angeles who currently is in the futuristic fusion group Snarky Puppy. You might have also seen him with John Mayer or doing choreography while playing on The Voice. Bob is an incredible musician who makes these quite informative little movies on YouTube where he gives you insights into live as a freelance musician, does Q&As, and even hands out some of the most informative lessons around—even if you don’t play sax. Bonus: I really need to revisit that Coltrane album. The big takeaway was kinda buried in the middle of the video. Find something that is manageable and do it. It doesn’t matter if it’s good or not. There it is. I always felt that since making movies like Bob or Janek Gwizdala (who also does incredible vlogs) that it wouldn’t matter that much. I was dead wrong. So, I’m taking Bob and Austin’s advice: I’m not going to break the chain. I will post something here for the next 30 days. I’m already sweating a bit as I type that because I’m not only in the very final stages of finishing an album, but I have a few gigs this month, Summer NAMM, the Iowa City Jazz Fest, and a dear friend from NYC coming to visit. But that’s not the point. 30 days it is. When I was nine years old, I went to visit my aunt in Colorado. It was August, so naturally the ski slopes weren’t in season, but she took me there to check out the mountains and ride the lift. Over lunch that day a news alert came on the television in the restaurant. Stevie Ray Vaughan had died. I had no idea who he was, but I distinctly remember where I was when I found out. Although I’m sure the news also mention Clapton and the others, only Vaughan’s name stuck with me. That was the first time I became aware of Alpine Valley. It’s kind of weird to have such a iconic tragedy be your first memory of a venue, but there it is. I really have no idea why that moment is so frozen in my memory. About five years later I dived head first into guitar and became a huge SRV fan. I learned a bunch of his tunes and watched the El Mocambo VHS damn near everyday before—and after—school. Years later I joined a band that would play in the VIP area at Alpine. It was a weird circle to complete: Going from that hot August afternoon on a mountain in Colorado to playing Jimmy Buffett tunes in a beer garden while literally staring at the hill that the helicopter crashed into. Last Fall, The Bamboozlers were asked to play the VIP event for Jimmy Buffett’s Labor Day Weekend show—which is a somewhat revered date in Parrothead lore. The show felt great, we played really well, and the crowd was excited thanks to a rather lengthy tailgate party. As soon as the second set was done we had thoughts of releasing the recording. After going through the (digital) tapes, we culled it down to about 70 minutes of prime Bamboozler jams, which is now available on our website. I have to admit, the first time I met Pete Huttlinger I was nervous. A few weeks before the NGW circus descended for the first time on the campus of Vanderbilt University in Nashville, I had emailed Pete through his website, introduced myself, and asked if we could meet for lunch while I was in town. The selfish idea I had was that I get to meet one of my all-time guitar heroes and hopefully lay the groundwork for getting Pete to work with NGW in some way. Not knowing too much about how to get around Nashville, it was decided that we’d meet at Sportsmans Grille. Immediately, Pete puts you at ease and you quickly forget that not only is this guy a world-class musician, but a world-class person. His wife Erin joined us that day and near the end of the lunch she leaned over. Erin nodded over my shoulder and when I turned around, I recognized either Brook or Dunn (I can’t exactly remember) was sitting at the next table over. Either way, Pete was still the most famous person in the room as far as I was concerned. We kept in touch over the years and when Pete would come to Connecticut to play we’d make the trek down and hang out for a bit. One of the shows was at a nature center in Canton, CT. The setup was a bit surreal: a bunch of chairs in front of a makeshift stage and then directly behind the performer was a collection of reptile tanks full of snakes with sheets over them. During the show, as Pete was nonchalantly playing “Superstition” or some other finger-twister he wandered over and looked down in one of the tanks. There were a few audible gasps, before Pete cracked a smile. It was as effortless for him to crack a joke as it was to play some unbelievably syncopated riff. The beauty of his playing was that you could feel the heart and work behind his playing, but you never heard it. Always grooving. Always smooth. The last time I hung out with Pete was after an afternoon at Vince Gill’s house. My colleague Andy Ellis and I were there to shoot an interview with Vince and Paul Franklin. During the interview Pete was just sitting on the porch just outside the door playing guitar. The whole scene was a bit surreal. Here I was with one of my favorite guitar writers (Andy) in the studio of one of the greatest country pickers of all time (Vince) and one of my other heroes was just hanging out on the porch (Pete). Oh, and that day I got to play one of Hendrix’s guitars. After the shoot, Andy, Pete, Pete’s wife Erin, and I went down to Boscoes for dinner. Pete was in great form and, like always, quick to drop a joke. Soon after we sat down an alarm went off from the satchel that carried around the battery for his pacemaker. Immediately, Andy and froze. I can’t even imagine the look on our faces as Pete started to look worried. Pretty soon Erin somewhat scolded him for the charade and both Andy and I took a deep breath. Pete thought it was the funniest thing ever. Pete was one of my first guitar heroes that ended up becoming a friend. Every year we could count on a Christmas card from the Huttlingers and every time we talked he’d ask about Cindy and the kids. I’ve always had a goal of really working on my fingerstyle chops. I knock away at it in spurts thanks to Pete’s arrangements and videos. Now I’m going to grab a thumbpick and work slow and steady through some tunes. Thank you Pete. For the music, inspiration, and friendship. A few days ago, the world lost a great hero. I wrote a bio for PG that you can read here. Once news spread through the social interwebs, it seemed like everyone had a Jim Hall story. Nels Cline wrote about the birthday lunch he had with Jim last week. Doug Wamble shared the story of some tough lessons. Critic Nate Chinen shared a handwritten note that he received from Jim after a “mixed” review. It seems like everyone who had come in contact with Jim had a memorable experience. His sphere of influence reached far and wide and luckily I was able to share a few moments with Jim and let him know how much his music means to me. In January 2004, my girlfriend (now wife) and I made our first trip to New York for IAJE, a jazz nerd elbow-rubbing gathering. The big motivating factor for making the trip was that NEA had announced their annual list of Jazz Masters and among them was Jim Hall. (Cindy was excited that Nancy Wilson made the cut as well.) As we were planning what shows to attend each night, a rather last-minute announcement was made that Charlie Haden was hosting a week of duets with guitar players at the Blue Note. Scofield and Frisell were among the guests that week. The final night was to feature Jim Hall. No offense to Sco and Frisell, but Haden and Hall were more contemporaries with some shared history and I thought it would be great to see two absolute masters play together. The night was going to be a busy one. It was going to start with dinner at the Blue Note along with the first set of Hall/Haden. Then, we were going to hop in a cab and go down to the Iridium to see Pat Martino’s group with Joe Lovano. We packed into the club and we grabbed a seat right in front of Jim’s Polytone amp. I think they might have talked about what tune they were going to start with, but the duo kept things very loose and casually talked about what to play next during the set. As the set progressed, Jim kept turning his volume down and by about the fourth or fifth tune the sound of his signature Sadowsky filled the room—without any amplification. Combined with Haden’s huge, round tone the intimacy of music completely shined through. After the show, Cindy wanted to use the restroom before we left for the Iridium. We walked upstairs and I waited outside the ladies room door. I looked to my left and saw another room and the door was slightly open. Inside I saw Jim talking to another person. As they finished, Jim opened the door and saw me standing there. “I’m Jason. Could you sign this for me?” I had just purchased the newly reissued Live! album that afternoon at Tower Records. 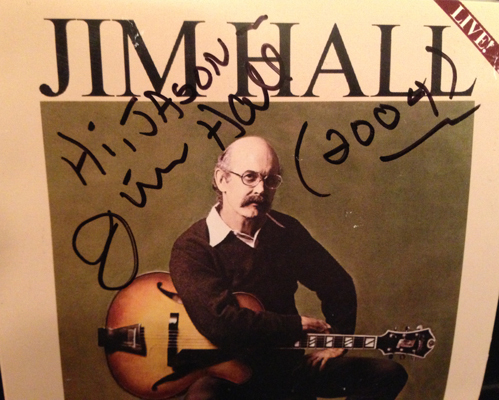 Jim Hall just invited me into his dressing room. I sat down and we talked for a while. After a few minutes Charlie Haden walked in and closed the door behind him. Charlie mentioned he just played a gig in Iowa City recently and we made small talk. They discussed how they felt the first set went and what songs they might want to play in the second set. At this point (admittedly) I totally forgot that Cindy was still in the hallway. So she just walked right in. Cell phone cameras weren’t that great at the time, but the look on Charlie and Jim’s faces when she barged right was a moment that I will forever wish I had a picture of. We continued talking for a few more minutes then I shook their hands told them how much I loved their music and left. A few days later I ran into Jim again in the hallway of the hotel. The fact that Jim Hall remembered my name–even for a mere 36 hours–made such an impression on me that I don’t really remember what I said back. Unfortunately, I didn’t get to see or meet Jim again after that. When I was at NGW we tried to bring him in for a duo clinic with Ron Carter, but his health had taken a bad turn and he just wasn’t up to it. Even in the last year I had been in touch with Devra, his daughter and manager, to possibly do some lesson writing for PG. Sadly, it wasn’t meant to be. A few months ago – during one of those “free trial” weekends – I came across the extensive new documentary about everyone’s favorite SoCal country-rock group, The Eagles. Like most everyone born post-1980, my only real connection through them was through classic rock radio and my parents spinning their second greatest hits album (because, as GH albums should, it is their greatest work. Plus, who didn’t have that album). I am such a homer for music docs. Even if I have a marginal interest in the band I get sucked into the story. The who, what, and why behind how different artists and bands did what they did. The new Eagles doc did just that – it opened a curtain and put everything out on the table. It was obvious, both due to the length and detail of the flick, that this was aimed straight at the diehards. Those who could name the guitarist before Joe Walsh (Bernie Leadon) and owned every Glenn Frey solo album. Recently, Bill Simmons wrote an excellent overview of the documentary (since the NBA season is over) and expertly described 20 key moments and themes he noticed after five intense viewings.He actually only watched Part 1 five times, he explains why in the piece.